When your hear or read some information about people who won millions in the casinos, you usually put on thinking cap and you are trying to guess how did they managed to do this. The casino gamblers' winning chances are not very high if you hope only on the good luck. The persistent gamblers use complicated card counting techniques and base their actions on the games' strategies. Others try to win at the casino and use different prohibited cheating methods to increase their chances on victory. Casino cheating methods are not recommended to use, but still it is very interesting to find out any information about them. Casino cheating methods were famous from the first steps of the casino industry development. Gamblers invented so many methods, that they all can be hardly described. Each day houses improve their security measures to define the cheaters and their techniques, so it's not an easy thing to deceive the casino staff. And the gamblers in their turn should be very attentive while playing, as the dealers cheating actions are quite often too. Dealers' Palming. Sometimes casino dealers can palm gamblers winnings. The gamblers once didn't notice that the dealer gat some chips from their wagering stacks. Cheating Inside the Deck. Any of the card games is open to cheating attacks. 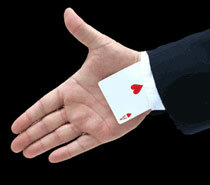 The banker or the player can remove some cards from the deck unnoticeable. Card Marking. It is one of the most popular, and even classical cheating methods. Players can scratch cards, hunch their corners or make some small signs by the nails. And I should repeat once again, that this technique is more convenient to the banker, as card shuffling machines define marked cards. Hiding the Chips. Usually card games gamblers are trying to hide some betting chips from the top of the stuck if they have bad hands. Collusion or Group Cheating. This method is used among several gamblers, which help each other to define the positive score and signal about it.